Reception of the American Loyalists by Great Britain in the Year 1783. Engraving by H. Moses after Benjamin West. The election of Donald Trump as US president raises concerns about the impact on Canada: on trade, energy policy, currency exchanges, pipelines, climate change. Most anxiety inducing is the toxic turn of civic discourse, as the US political process tolerated expressions of racism and sexism, as well as outright lies and intimidation. The contaminating effects, we fear, may spread north. Although Canadians now have a cultural confidence about their differences from Americans, and believe that they should be protected, the task is complicated by the difficulty of identifying these differences. At a very mundane level, Canadian “niceness” might be undermined. That niceness, however, is not from Canadians spending more time in Sunday school (lower than in the US) or table time with parents over supper. It reflects a culture of comity, of courtesy and consideration in civic discourse, dating back to the Loyalists of the 18th century. As refugees from a war they opposed, these Americans moved north armed with words not weapons as the primary tools to rebuild shattered communities and forge deliberative governments. Loyalists are tricky to define. They spanned ideologies, religious backgrounds, and socio-economic positions, from humble farmers and tradesmen to wealthy merchants and office holders. But they shared a common value: they deplored elite manipulation of unruly youth and populous disenchantment for political ends. They criticized both rebels and the British for responding to a constitutional crisis with armed violence. In a world in which participatory government was still unusual, the Loyalists’ distress at the resort to violence was not conservative squeamishness. They were genuinely concerned about stewarding what was politically progressive by any standard of the day. Violent revolution would only resolve the constitutional crisis by rupturing the political community. The rebel success in founding the United States, and the subsequent wave of revolutions in France, Haiti, and Spanish America, twinned violence and political progress in the narrative of modernity. Resorting to violence to resolve political problems and promote political progress was normalized. British North Americans took a path to modernity based on dialogue and discourse. Many results were salutary, most famously responsible government. Others were not salutary. Canada’s cultural complexity conflicted with 19th-century notions that societies with participatory government could only be stable if culturally homogeneous. Canadian political leaders used words coercively and with violent consequences to eliminate the complexity they deemed most dangerous. They dispossessed Indigenous peoples and sent their children to residential schools, made French Canadians and Acadians second-class citizens, blocked Chinese residents from citizenship, sent Sikhs back to India, turned away Jews fleeing Hitler, and interned Japanese Canadians. And all done virtually without firing a shot. The Second World War and Holocaust drove home the unconscionable consequences of the belief that social stability and participatory government depended on cultural homogeneity. The lesson was not lost on Canadians, who questioned the imperative of cultural homogeneity, and slowly began the seemingly risky enterprise of building a politically stable society on multicultural foundations. At the core of this bold and contested experiment was a widespread Canadian confidence in words as the best tools for forging social stability, one that spans diverse cultural groups. In October 1970, Canadians deplored both the FLQ’s kidnapping of Pierre Laporte and James Cross and Pierre Trudeau’s military mobilization, a position reminiscent of the Loyalists deploring both the rebels and the British for resorting to violence to solve political problems. This Canadian culture of comity balances individual speech rights and the commonweal in more communitarian ways than does the American position, which is weighted heavily toward individual speech rights. As well, the growing emphasis in the US on the Second Amendment reflects a worrying shift from a culture of political speech to a culture of political intimidation and potential violence. Canadians have actively utilized and protected speech rights and the public sphere. Canada has convened more royal commissions than other commonwealth countries. Laws against hate speech are constitutional. Stephen Harper’s disinterest in public discourse, failure to call First Ministers’ Meetings, avoidance of press conferences, and muzzling of scientists contributed to the Conservatives’ defeat in 2015. This culture of comity, what outsiders experience as Canadian niceness, is worth stewarding and practicing. In a world where words are increasingly deployed as weapons rather than the working tools of social relations, Canadians should affirm their legacy of using words as the building blocks of progress. Although that legacy includes serious errors of commission that need rectifying, as the Truth and Reconciliation Commission made clear, there have also been noteworthy successes. Stewarding and refining a culture of comity is still the best path to social stability, human dignity, and peace. Elizabeth Mancke, a Canada Research Chair at the University of New Brunswick, is part of a SSHRC-funded team examining “Unrest, Violence, and the Search for Social Order in British North America and Canada, 1749-1876.” She thanks the team for stimulating discussions that helped inform this essay. This essay has also been posted on the Early Canadian History blog, Borealia. We are all thinking of the implications of the recent US election for how we research and teach Canadian and American history. Thanks are due E. Mancke for such a thoughtful contribution to that conversation. Given my own previous work, I’m the last person to raise questions about the role words can play in governance; their importance to the ways in which people conceive of public authority both in terms of an ideal of civic discourse and in terms of the degrees to which lived experience made that ideal credible or not at various points in time. But I worry about the pressure to proceed from there to reinvent, yet again, some national exceptionalism whereby Canada and the United States have distinct political cultures read forward from particular aspects of their colonial pasts. If loyalists bequeathed a more communitarian approach to public speech it was an communitarianism of fear. It meant less press freedom, regular use of sedition and other laws, and licensed collective violence against opposition newspapers when other forms of regulation failed. 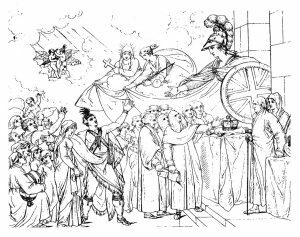 Benjamin West’s depiction of Britannia’s reception of the American loyalists wasn’t about words much less about civil debate among citizens. It was about the paternalism by which allegiance and deference won benevolence and inclusion (without challenging various hierarchies, of course). There’s also West’s The Death of General Wolfe. There, shots were fired. They weren’t the last. It is a long way from Loyalists to today and to argue their centrality in thought and behaviour is to negate an awful lot of history and an awful lot of Canadians. A minor point: those around in 1970 remember all too well the widespread enthusiasm for Pierre Trudeau’s use of War Measures. It was a scary time when so many Canadians were so bloody minded. More significant is that responsible government, lauded here as an example of comity, was launched with election riots throughout the 1840s and with the burning of Parliament by a mob in 1849. Do not let our response to developments south of the border be a new round if Canadian myth making. Yes, we need to avoid exceptionalism and myth-making (which can appear in a variety of ideological guises). But we should not allow that concern to prevent us from researching and debating the differences as well as the similarities between Canada and the United States. In between the extremes of nationalist exceptionalism, on the one hand, and a perspective that ignores national borders and cultures, on the other, there is surely plenty of room for discussion. I want to thank Jeff McNairn, Michael Cross, and Jerry Bannister for their comments. In general I agree with them. But I want to offer one further element to the discussion. All societies have incidents of violence, periods of violence, and advocates of using violence for social control. Canada is no exception. But how societies choose to address tendencies towards violence, legitimate or condemn it, mobilize or restrain violence varies dramatically. The history of Canada and the United States, as well as the current political climate in each country, indicate significant and substantive differences in how the two countries respond to violence. Some differences are embedded legally and constitutionally, some are cultural. The hundreds of examples of the murderous violence of Americans does not give Canadians the right to be smug about the more decorous violence of elite intimidation and willful neglect or the legislated violence against minorities, women, workers, and other people with less social power. I do, however, think it is important to try to understand the cultural differences between Canada and the United States. As someone who has spent a considerable amount of professional time working on it, I would argue that the era of the Atlantic Revolutions made a difference, when militant violence in the name of political progress and participatory government became not just legitimated, but valorized. By the end of the American War for Independence, some Americans were concerned with what the revolution had unleashed, particularly as it pertained to the mobilization of unrest for political ends, and sought ways to contain its impact, including the creation of the Electoral College. People in the British North American colonies that remained within the Empire were uneasy and remained uneasy right to the present day with what it meant to live next to a country that had legitimated and valorized militant violence in the name participatory government. There will always be people who urge the use of violence. There was violence at the time of the implementation of responsible government. There was and continues to be too much physical violence against Indigenous peoples. There were Canadians who approved of Trudeau sending troops into Quebec. To make the discussion about whether there were or are incidents of violence or whether there were and are advocates of violence is to skirt the larger, and I think more important, issue of understanding the cultural meanings and validation given to violence in its various manifestations, and the differences among societies. It does not absolve any of us from recognizing and speaking out against violence in whatever form it takes. Rather it should give us better ways to respond to violence in its complex and often insidious manifestations. Understanding the profound cultural development of the Age of Revolutions when violence and political progress were twinned, legitimated, and valorized, and understanding the people who expressed great concern with that development and who lived in the shadow of the country that most exemplified that development seems a project worth engaging. I totally agree, Jerry. Sometimes the international border matters a great deal (the loyalists and fugitive slaves post 1834 certainly thought so as did those interested in criminal extradition as Bradley Miller has shown so compellingly in his recent book on the period before 1914). Comparison can be very illuminating and sometimes that comparison will be between what are now nation-states. To what extent the empirically established differences and similarities are or became “cultural” in nature raises another set of definitional and methodological problems. The proof is in the payoff in historical understanding, not in the allegiance to any particular historiographic or political camp. I also value your distinction between the national and nationalist. It’s an important one too easily lost sight of. But when differences within the dichotomous pair are downplayed or some essence or origin is found in one aspect of the (perhaps distant) past to be singled out as the founding moment (good or bad) of some difference we think we see in the present (leap frogging over all the intervening history as Michael Cross worries can happen), I think we are no longer talking about comparison as a historical approach. By all means compare things – it can be an extraordinarily useful and rigorous methodology – and just because much of the vast literature that has done this along Canadian-Anerican lines in the past has been, in my view, problematic isn’t a reason not to try to do better. You’re right, Jeff, about the perils of comparative approaches (whether across national borders or across eras or across oceans). One could argue, I suppose, that history almost always entails some type of comparison, because virtually everything and everyone we study comprises different component parts. We can, in other words, keep splitting the historical atom until we reach biography. My hope is that, in recognizing the perils of comparitive approaches, we do not lose sight of the promises. Regardless of how we frame our approaches, the questions that we ask about the past will always be informed by the present, whether we like it or not.